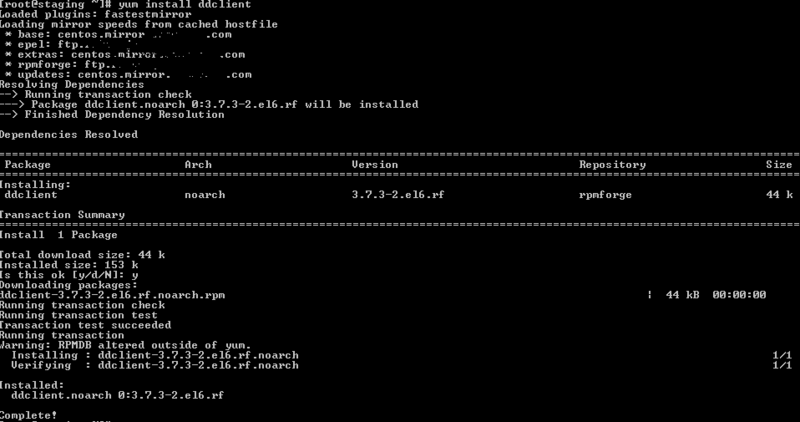 DDclient is a Perl-based DDNS client used to update dynamic DNS records for domains. DDClient, most commonly used in Linux, Unix and FreeBSD, has the same function with DNS-O-Matic in Windows platform. DDClient supports multiple DDNS services and it can fetch your constantly changing WAN public facing IP address in a few different ways. This tutorial guides you on how to install DDclient on a CentOS machine. The procedure works also on Red Hat Enterprise Linux (RHEL), Scientific Linux and related distributions. DDclient requires Perl and IO::Socket::SSL perl library for ssl-support. Patch is required if you need CloudFlare DDNS support, which is not currently built-into DDclient. If you want to use DDclient to update dynamic IP address to DNS hosted by CloudFlare, patch the executable for the CloudFlare API support. New version of DDclient released after version 3.8.2 will most likely have CloudFlare support built-in, and thus no longer requires any patch. Modify the /etc/ddclient/ddclient.conf file to enter the dynamic DNS service provider and which “A” record of domain that you want to update once the IP address changed. Several examples are included in the config file itself, or you can refer to the guide for supported protocols. The IP address of the “A” record for the domain should be changed. When everything is OK, runs DDclient using init script, which runs it as daemon with delay set in the configuration file, so additional cron job is not necessary. The installation of DDclient is done. You can now configure /etc/ddclient/ddclient.conf to make DDclient works with the dynamic DNS service provider and the domain that you’re using. Several examples are included in the config file itself, or you can refer to the guide for supported protocols. If you want DDclient to support DDNS on CloudFlare, download the patch specified in method 1 to /usr/sbin/ directory, and run the patch there. The IP address of the “A” record for the domain should be changed. When everything is OK, make sure that DDclient is running as daemon using init script. In such case, additional cron job is not necessary.